For a prospective student considering a job-training program, one question that can be hard to answer accurately is: What am I likely to earn if I finish the program? Even if a school wanted to provide an accurate answer, the best it can do is survey graduates and hope for enough honest answers to give a reliable reply. Census data does provide earnings of college grads by major. Payscale gathers data on wages and education on its website, but relies on visitors to its website to volunteer information. College Measures pulls data from state unemployment insurance reporting systems to give a glimpse of salaries at some states’ two- and four-year schools. But what if you’re contemplating a certificate in cosmetology or massage therapy in Los Angeles or a medical assistant training program in Miami? An obscure Education Department “gainful employment” website has some hard facts. It posts earnings data for each of several thousand programs that are taken directly from paychecks by the Social Security Administration, which keeps tabs on worker’s earnings in order to calculate future retirement benefits. For many programs, the picture isn’t pretty. Take the Newberry School of Beauty in Granada Hills, Calif. As required by the Education Department, it discloses on its website that the 12-month program in cosmetology costs $15,818. It also says that nearly two-thirds of the students took loans to pay for the schooling, that only 42% of those who completed the program did so in 12 months, and that 79% of those who completed the program between July 1, 2013, and July 30, 2014, got a job within six months of graduation. If you dig a little deeper, one finds that 28 of the 35 graduates in the Class of ’13 landed cosmetology jobs; all were working less than 32 hours a week. The required disclosures reveal little about how much money those graduates make. The answer, according to the latest data on the government’s “gainful employment” web site, is: Not much. The 71 students who took loans and completed Newberry’s cosmetology program between October 1, 2007, and September 30, 2009, earned an average (defined as the higher of the mean or the median) of $12,487 in 2011. By way of comparison, 30 hours a week at the federal minimum wage of $7.25 paid $12,090. Some cosmetologists may get tips that they don’t report to the government. Newberry’s CEO, Deanna Jacobsen, didn’t respond to requests for comment. A sampling of the data on the Education Department’s gainful-employment site—which my Brookings colleague Matthew Chingos helped me analyze—underscores the lousy pay-off to some job-training certificate programs. We looked for places (by zip code) where there were data on several programs in the same occupation. In the greater Los Angeles area, we found 31 schools offering certificates in cosmetology, a licensed occupation in California that includes curling, coloring and cutting hair and can include skin and nail care. Students who got certificates at some community colleges did better and paid less for their schooling, though they still didn’t earn very much: Fullerton College ($15,960) and Cerritos Community College ($17,139). Earnings for graduates of the usually more expensive for-profit cosmetology schools averaged between $7,116 at the Cru Institute of Cosmetology & Barbering (Garden Grove) and $15,280 at The Paul Mitchell School (Sherman Oaks). Looking across the country at 671 cosmetology programs, we found that average earnings at 60% of the programs fell between $10,000 and $15,000. Only six programs produced graduates whose earnings average more than $20,000 a year. 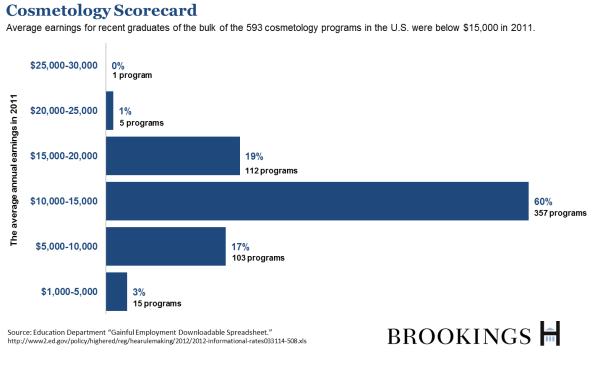 The wages of graduates of cosmetology programs aren’t unusual. The average wages of graduates of most of the 19 massage-therapy programs LA area were below $15,000. People who earned medical/clinical assistant certificates in the Miami area earned an average of between $10,378 (MCI Institute of Technology, West Palm Beach) and $17,298 (Southeastern College, Green Acres, Fla.). Among 443 medical/clinical assistant programs across the country, more than half (256) have graduates whose earnings average less than $17,000 a year. The “gainful employment” website does point to some programs with better payoffs: Average 2011 earnings of graduates of certificate programs in radiologic technology and for licensed practical nurses exceeded $40,000 in several communities. The Education Department site isn’t user friendly. To find the earnings of graduates of a particular program, one must download a huge, but easily searched and sorted, spreadsheet, and look several columns to Column M, which is labelled “Annual Earnings (Denominator)” The site also has information on the typical annual loan payment for graduates of each program. Under the federal regulations that are to take effect July 1 (and that recently survived a challenge in court), schools in which the typical graduate ends up with loan payments above a certain threshold will be barred from federal loan programs. One, as the presidents of the nation’s elite universities remind us frequently, the value of a college education cannot be measured exclusively by the size of graduates’ paychecks. But paychecks are a darn good way to measure the value of a certificate program at a community college or for-profit training school—and some of those programs aren’t worth the cost. Two, prospective students deserve good, and easily digestible, information about job-placement rates and earnings of programs they are considering. We’re making progress on that—and the Education Department website underscores how much information the government itself has (at least for programs for which there are lots of federal student-loan borrowers.) But we haven’t gone as far as we can. A version of this post appeared on WSJ.com.